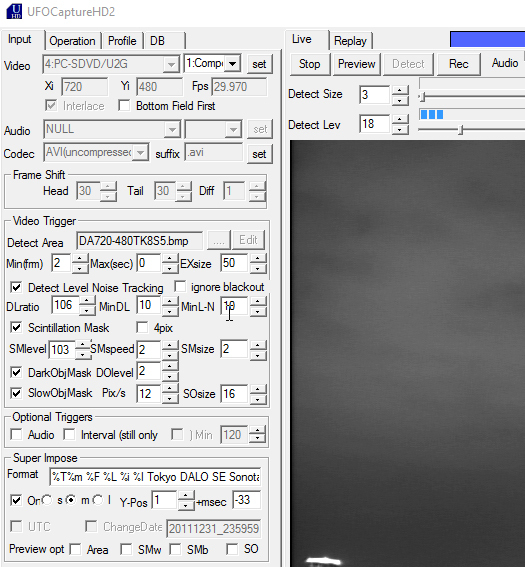 I made this night the first time observations with the ilce-7sm2, blackmagic intensity shuttle and UFOCaptureHD. It seems like I have a problem with some pulsating noise. When I start Detection everything works fine. After a while (about 1 minute), the Detect Size Level starts pulsating. It’s getting on a certain level and falls back to 0, goes to a higher level and falls back to 0, goes to an even higher level and falls back to 0, and so on. After a short time, UFOCaptureHD starts to record permanently. I used the Scintillation Mask and have set the SMlevel as high as I could. No effect. If I activate the “ignore blackout” (could not find out for what this function is), than the noise is gone, but unfortunately the signal too. Mask the black border of the frame in the Detect Area Editor also has no effect. Any suggestion what I could do? 1. snapshot image of your Input sheet. and Live sheet Detect Size setting. The most probale cause may be the noise or faint air plane detecting. Thank you for your support and sorry for the delay in responding. In the meantime, I bring it to work. I reduced the ISO value at the Camera and after that it worked properly. It’s funny, because I have the same problem with one of my WATEC Systems that I run. I use there a VC006AUSB Grabber from ems imaging: http://www.ems-imaging.com/index.php/usb-3-0-video-capture/6-ch-a-v-video-capture and operate 4 Watecs. Only when I set the Deinterlace settings at ?Motion Adaptive“ then It works. 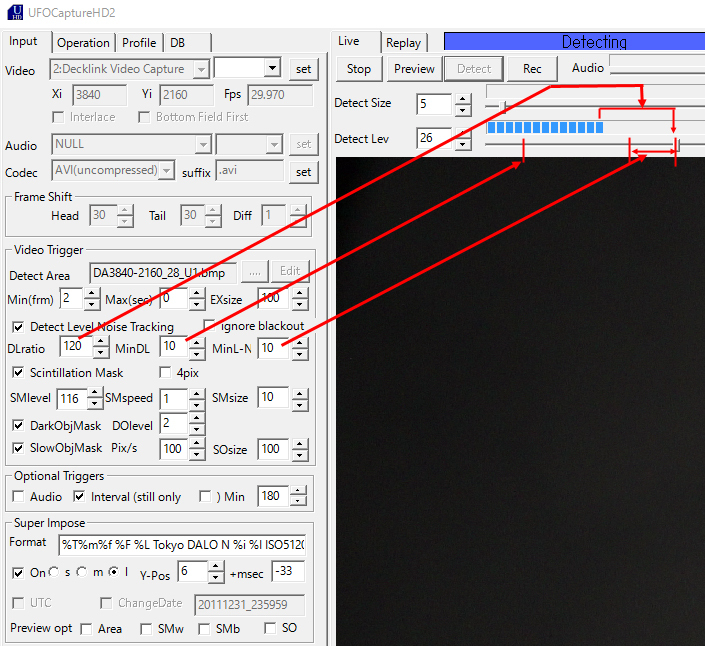 The result is then an deinterlaced Capture which seems not to bee ok.
What value for increasing the Detect Size or DLratio settings are usable to detect Meteors and TLE? I think I cannot set them too high. Here are sampls for each resolution of my station. These are not most sensitive, but aiming stable meteor observation. You can set more sesitive, but there may be many unwanted clips or long clips. It depends on the purpose. 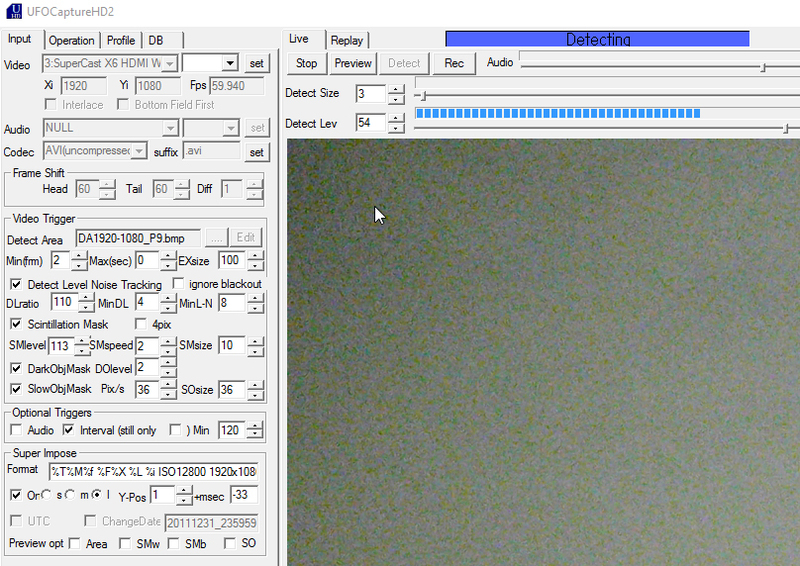 Anyway, S/N of video source is very important for motion detection. It should be above around 30db. I think it was the MinL-N and MinDL values. They were obviously set to close. I'll try it now with the new settings. Thank you very much for your very valuable input!